Support of interests in state authorities, pre-trail and judicial settlement of disputes. Over a few years, many business representatives at all levels, from individual entrepreneurs to multinational companies, choosing Slovakia as the base country for corporate structuring, export-import operations with the European Union, placing IT teams, diversify production capacity, and location of research units, resulting as comparative ease of overcoming non-tariff barriers, and the attractiveness of the investment environment. Advocates Officium, our offices in Ukraine (Kiev) and Slovakia (Bratislava),suggest our customers complex support, as in the opening companies and doing business in their use, and for obtaining a residence permit for yourself and family members or employees. In our opinion, this country is the best “entry point” into the European market, judge for yourself! Attractive geographical location, providing 350 million paying customers within a radius of 1 thousand kilometers. Through membership in the WTO, the European Union, the Schengen area and the Euro Area, Slovakia offer huge business opportunities for the realization of all advantages provided by these communities. One of the most growing economies in the European Union. In Doing Business 2016 the world Bank, Slovakia ranks 29th out of 189 countries, the level of domestic national income per capita in Slovakia is $ 26 110 (40th place out of 186 countries of the world). 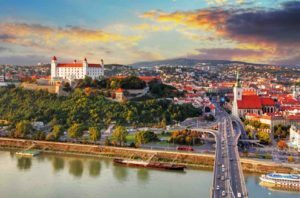 According to experts of the World Economic Outlook of Slovakia is the most promising place for doing business among the countries of the Visegrad group. Slovakia is in the TOP 50 countries on the value of The ICT Development Index (Index of development of information and communication technologies in the countries of the world). The most level of labour productivity in Central and Eastern Europe, according to Eurostat, which gives businesses the possibility to carry the low costs of labour in comparison with high productivity of skilled labour. At the legislative level in Slovakia secured mechanisms of state stimulation of export and investment transactions. In the optimization of corporate structures in the jurisdiction of this country is the most profitable and optimal, especially because the tax on dividends in Slovakia is only 7 %. A high level of personal security. The Global Terrorism Index for Slovakia in 2015 amounted to 0 – the level of terrorist activity. A wide choice of international schools, free primary, secondary and higher education. Slovakia accounts for 36 public and private higher education institutions. The Education Index for Slovakia is 0.83 (37 out of 187 countries). A country that is included in the “Schengen area”, which means that travel on Europe without borders. Environmentally friendly country. The Environmental Performance Index for Slovakia in 2014 was 74,45, where 100 is the maximum value of (21 out of 178 countries). Historically friendly attitude towards foreigners. Cultural and mental closeness of our peoples will allow you to quickly and easily adapt you and your family to life in Slovakia. To get at these questions more detail information, you can always contact our company with the request. And our lawyers will give you advice and will have a full range of services in this area.